University of Delaware Cooperative Extension is helping educate state residents who are interested in farming but lack experience through its new and beginning farmer training program. The program, which started in February, is running one session in New Castle County and one in Sussex County and is geared toward new and beginning farmers working in small-scale vegetable and/or fruit production. The beginning farmers tend farms, community gardens or plots of land of different sizes and have varied reasons for taking the class, with some wanting to develop market gardens or small scale commercial farms, others seeking to add to existing small farms, and still others planning to provide locally grown food for their communities. The class covers all aspects of growing, from crop specific production practices to food safety to pest control to plant diseases to developing a sound business plan. 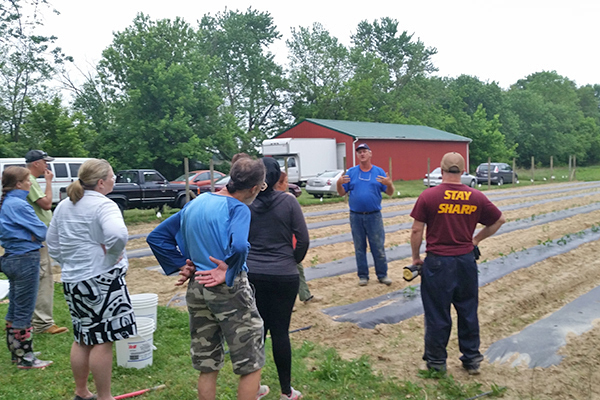 “I think that, more than anything, this class is an example of how Extension is helping the small, non-traditional farmer,” said Carrie Murphy, a Cooperative Extension agent and lawn and garden program leader. Tracy Wootten, a fellow agent, said the beauty of the class is that the Cooperative Extension educators are able to tailor it to meet the needs of the individuals instead of just having a general overview for the participants. “A lot of people in the class had already started thinking about becoming growers and this helps them get moving on to the next steps, or evaluating what they already had considered,” said Wootten. The program involves classroom sessions as well as field trips to participants’ farms or commercial farms – such as Filasky’s Produce in Middletown and Ma and Pa’s Produce in Bridgetown – so participants can learn from growers in the field. Gordon Johnson, a Cooperative Extension fruit and vegetables specialist and an assistant professor in UD’s Department of Plant and Soil Sciences (PLSC) who is the lead instructor in the program, said he tries to vary the classroom sessions to meet the needs of his audience. “For example, upstate, there’s more interest in organic growing systems so I cover more on that topic. But it is challenging because there are some people who might be interested in mixed vegetable production, others in specific fruits such as blueberries, others who are interested in flowers, and still others who are interested in community gardens,” Johnson said. Johnson also said that the New Castle County class tends to have more participants interested in community gardens and urban agriculture, while the Sussex County class has a more traditional interest with people looking to start a business or add a side business. Class participants Susan Kemer is one of the participants in the class and has been managing a garden on about one-third of an acre at St. Andrew’s School in Middletown since fall 2012. She said the hands-on learning has been the most beneficial part of the class, adding that other valuable aspects have been connections she has been able to make with other farmers and the resources for growers in the area that she discovered through the course. “I took the class because I wanted to learn more about farming, and I have been learning more,” Kemer said. “There is obviously a huge learning curve because I don’t have an agriculture background and I’ve been learning the science and methods involved with agriculture. The class has been very helpful in melding it all together and it’s been nice because I’ve made a lot of really good connections with other beginning farmers.” The class was able to tour the organic garden that Kemer tends at St. Andrew’s as one of its on-site visits and she found it beneficial. “Having them come and visit was good – just to have those boots on the ground learning and observations and recommendations from our teachers and facilitators.” Kemer said that one of her goals for the garden at St. Andrew’s is to “try to find ways to engage students, not just in harvesting and planting and labor but also in the science behind it, and to try and help them see that part of it.” She said the class has been very helpful in that regard. Ron Walker Jr. is a class participant who owns a farm that is about one-third to one-half an acre – and that he plans to expand to nearly one full acre next season – off of Route 40 near Porter Road, growing lima beans, tomatoes, peppers, watermelons and pumpkins. He said the networking is a great feature of the class. “I enjoy the knowledge that the other people have. It prevents a lot of trial and error,” said Walker, who added that another benefit of the class is being able to “pick Gordon Johnson’s brain.” Networking Wootten said that when it comes to adult education, “You learn as much from the teacher as you do the other students. There’s camaraderie there, and you get to know each other and you can talk about things – it’s something they have in common. Through the networking with current growers, they can learn from them about things they tried that maybe did or didn’t work. It’s important for them to see what’s been successful, too.” In addition to the farm visits, participants are invited to Cooperative Extension field days, which take place at the 344-acre research farm in Georgetown at the Elbert N. and Ann V. Carvel Research and Education Center. During sessions they also were able to tour UD’s Fischer Greenhouse and the new high tunnel installed on the University’s Newark Farm. Helping hands With such a sprawling program topic, the program has been helped by many Cooperative Extension agents and specialists, including Johnson, Murphy, Wootten, Emmalea Ernest, Joanne Whalen, Nancy Gregory, Mark VanGessel, Maria Pippidis and Dan Severson. Mike Wasylkowski, a small farms educator with Delaware State University, also helped with the class. Article by Adam Thomas Photos courtesy of Carrie Murphy and Tracy Wootten This article can also be viewed on UDaily.